It is with regret that the Québec Religious Heritage Council (CPRQ) learns the death of Father Paul-Emile Paré, which occurred July 7. Mr. Paré was the first president of the Québec Religious Heritage Foundation (now CPRQ), from the origin (1995) until May 2004, almost ten years. Administrator until 2007, he was also, from 1996 to 2010, member of the Eastern Townships Religious Heritage Roundtable. Born April 26, 1934 in Saint-Camille, he was the son of Emilien Paré and Clémence Darveau. He will lie in the chapel at St. Michael's Cathedral, Sherbrooke, Saturday, July 16, from 9 a.m. The funeral will be at 11 am. He will be buried in the crypt of St. Michael cathedral (Sherbrooke). On the picture, we see, far right, Father Paul-Émile Paré during a public announcement, November 2001. 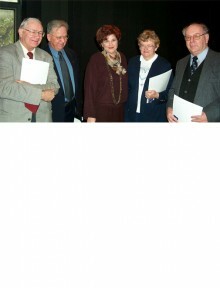 From left to right: Mr Germain Casavant, founding member of the organ committee and administrator from 1995 to 2009; Father Claude Turmel, Secretary and Executive Vice President of the organization from 1995 to 2003; Ms Diane Lemieux, Minister of Culture and Communications from 2001 to 2003; and sister Flore Savignac, Missionaries of the Immaculate Conception, member of the Board of directors from 1995 to 2002; and father Paul-Emile Paré.